News: Japanese architect Shigeru Ban has won a competition to create a museum of fine art and culture in Taiwan's oldest city. 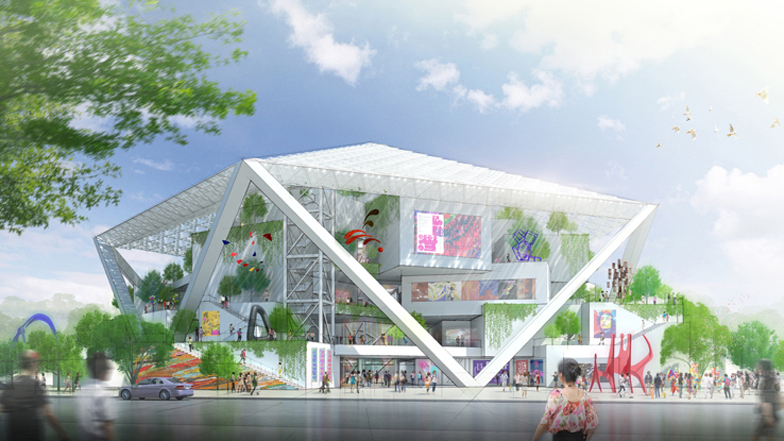 In an announcement on its website, Shigeru Ban Architects revealed it had won first prize in the international contest organised by the Tainan local government in a bid to promote the development of the city's fine arts culture and industry. The £36 million Tainan Museum of Fine Arts is conceived by this year's Pritzker Prize winner as an assortment of indoor and outdoor spaces, sheltered beneath a large pentagonal roof canopy. Covering an area of 26,400 square metres, the project will accommodate exhibition galleries, archive facilities, educational areas, shops and restaurants, as well as landscaping that includes an outdoor sculpture park, a water fountain and a children's playground. The site earmarked for the development includes the former Tainan City Police Department building, which will be restored and repurposed as part of the project. Shigeru Ban Architects will also oversee the overhaul of the Yoai Road streetscape and parking areas. Speaking to Dezeen earlier this year, Ban said that he was going to be "very careful" not to extend his office following the increase in commissions that followed his Pritzker win in June, and stay focused on "quality, not quantity". "I like to keep doing the same thing, spending a lot of time for each project, designing myself and being on the site and listening to the people who are living there," he said. The architect also recently completed an art gallery in American ski resort Aspen.